The packaging is so cute! It's a tiny tube in a gorgeous bright pink colour (each of the 3 shades - Coco Rose, Cherry Blossom and Mocha Orange (how cute are those names?) come in a different colour tube) with some yellow detailing. The tube is a reasonably large size for a lip balm tube, and it seems like it would last you a while, as you only need to use a tiny amount of the product at a time. 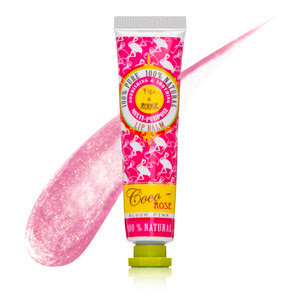 The actual lip balm is more of a moisturising shimmer lip tint. Initially, I wasn't a huge fan of the colour though, as this is a soft pink shade and i don't particularly like having pale lips, but I found that if I just blotted some of it off with a tissue after applying, my lips were left in a nicer baby pink shade. One of the best things about this products are the ingredients. Figs & Rouge products are 100% natural, 100% pure and they contain no petroleum or synthetic aromas and colours. Plant ingredients and naturally occurring omega acids have also been used in the product which help to restore dry lips and keep lips soft. Overall, I found that this product left my lips soft for hours until i reapplied the product and it tastes delicious which is fantastic. I hadn't heard of Figs & Rouge before but now i can't wait to by more of their products. I'd recommend this to absolutely everyone and i'm definitely going to repurchase this product (maybe in a different shade though). I give this product 4.5* (i dropped the last 0.5* because of the colour). Have you used any of the Figs & Rouge Lip Balms before?